The slow traffic are on all country roads .. not only near a city … it is like more realistic. This mod changed the complete standard Traffic. All Cars and Truck get transmissions, adjusts of power and Speed. All of this i changed the Traffic_Data up to 112 Cars .. So you get more Traffic. Rush Hours included from 6 to 9 am and 18 to 20 PM. HAHAHA .. tell me wich mod have the solution that trucks and Busses don´t drive on the 3. Lane little kid ? I stole from others .. I hope for you, that no one read your Comment to strong … because you will cry .. i promise you ! compatible with promods? and or compatible with Real Traffic Density v3.0 by Cip ? Thanks.. Yes compatible with promods . so you should test it alone .. and take that one what you prefer yourself .. But you should run each mod about one week ingame … by changing the definitions ingame . the game have to calculate completely new all of the traffic .. you know ?! O M G …a traffic mod that works how a traffic mod should work! I waited a long time for that! had a look in adi’s files, the fast lane on motorways is innovative which gives originality to this mod and its author. Thank you for your review .. Yes it was a many Work to get this solution . And yes there is a many work forward. 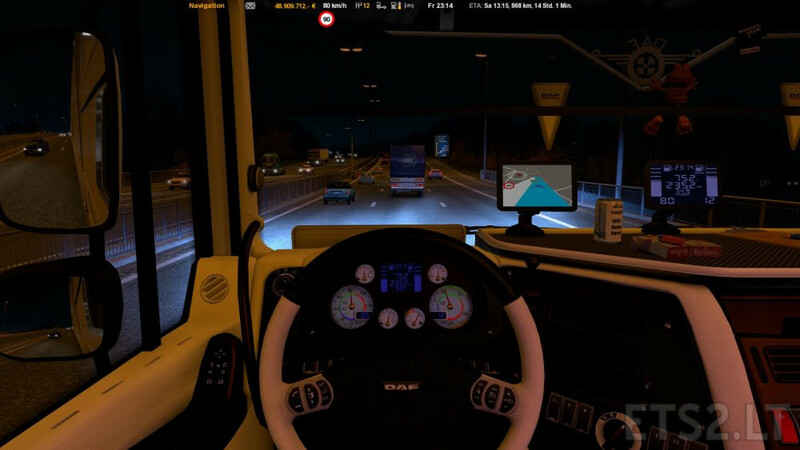 But we will se what the future will bring from side of SCS software … There are many bugs from the original Work of the vehicles ..
sorry to say it but rule for forbidding trucks and buses on 3rd lane don’t work well. by default is very rare that trucks goes on 3rd lane. with this innovation trucks disappear from the road when driving on 2nd lane and there is a junction of another lane. also I have tested for cars, sometimes cars are disappearing, sometimes just hang waiting the 2nd lane to be clear… but sometimes cars are also driving on 3rd lane. a friend that is expert in this game confirmed to me that prefabs must be changed in order to achieve this goal, I would say is rather the job of scs for doing it, but hey, thanks for trying. it is ok .. so i know that the work should be on SCS Software. But if never one say with a mod .. Hey we want that .. i think SCS will don´t do it … it was trying to make it more realistic.. Sometimes it works .. sometimes not .. It is the same problem as you want to delete a car for a special country . it will be seen equal of what you got them car to spawn or not . so i think about the send datas about you play, they get infos about what you play .. i´m sure .. not only about the forum .. The Game is from beginning to now . .every time development. And it is no end in sight. adi2003de, can you make it for ATS?